3D printing has come on leaps and bounds in recent years, when we talk about 3d printing we no longer talk about just printing small scale models for the fun of it, but we are talking about producing realistic prototypes and end use parts, for many different industries such as medical, consumer goods, manufacturing, aerospace and automotive, just to name a few. 3D printing is changing lives for the better, for example 3D printing in surgeries, aerospace parts, and dental applications. We run through some of the top five innovations in 3D printing that we’ve seen so far. How will surgeons build Tessas nose with 3D printing? In an operation carried out at Great Ormond Street Hospital in London, plastic surgeon Jonathan Britto used a 3D printer to make a model of Tessas skull, then designed a mould that fitted to her face underneath her skin. The surgery will be carried out every two years to ensure that her nose grows at the same rate as the rest of her body. A final prosthesis will be fitted when she reaches her teenage years, meaning sheâ€™ll have the look of a real nose when she reaches adulthood. This surgery had never been done before and is just one example of some incredible innovations in 3D printing in the medical field. Traditionally astronauts had to rely on supplies carried on board with them from Earth, but what if something was urgently needed, or supplies ran out? Sometimes it wasn’t always feasible to send additional supplies or tools into space, either it wasn’t possible, or the waiting times were too long, sometimes taking as long as a year to reach the space station. NASA decided to send a 3D printer up into space so that astronauts can 3D print supplies when needed, resulting in lower costs, and much shorter waiting times. Design files are submitted from the Earth allowing objects to be made on the 3D printer in space, this opens up so many opportunities for astronauts, and allows them to create objects on board that perhaps weren’t previously able to be launched into space. Mould making experts at HASCO have developed a rapid, cost saving method for producing low volumes of injection moulded parts for samples, prototypes and small production runs, using Stratasys additive manufacturing technology. Using Digital ABS on a Objet500 Connex 3D production system, HASCO were able to cut down on time spent on design modifications and lower costs significantly, compared to using conventional tooling methods. This is an exciting new approach that gives HASCO the flexibility to quickly and efficiently produce their sealing screws making them more productive and profitable. A three year old toddler benefited from innovative kidney transplant after suffering from heart failure, and subsequently kidney failure at just four weeks old. 3D replicas were made of the toddlers abdomen and of the kidney which was donated by her father, this aided the surgeons in the operation to plan how to fit an adult sized kidney into the body of a toddler. 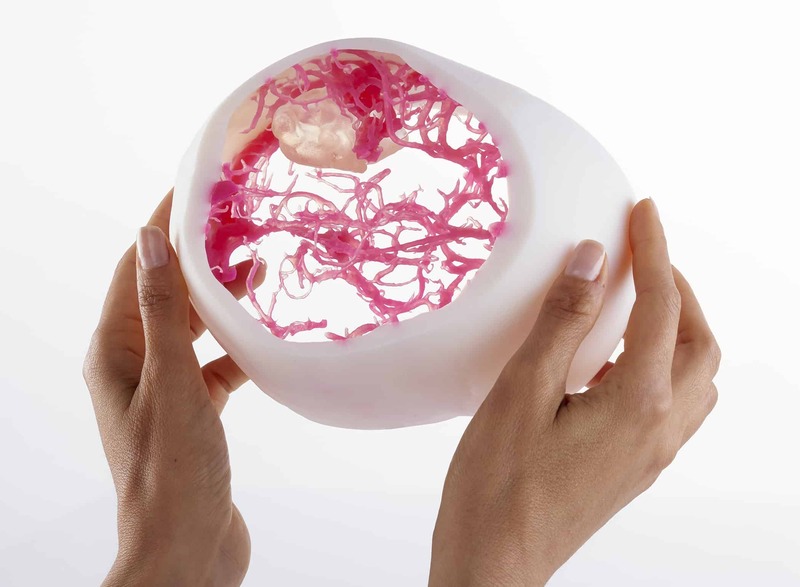 This was the first operation of its kind, the 3D models that were used as an aid for the surgery ensured that this complex type of surgery was done in the safest way possible, the models allowed doctors to see intricate blood vessels and gave them the ability to plan precisely where the organs would be placed. A surgery that is this complex requires a significant amount of planning, and without the aid of 3D printing would have been much more difficult. New York fashion week saw an exciting new breakthrough in fashion when fashion designers threeASFOUR debuted their two unique 3D printed dresses using a nano enhanced elastomeric 3D printing material which will be commercially available later in 2016. The 3D printed dresses were made possible thanks to Stratasys’ multi colour, multi material 3D printing technology. using the Connex 3 range. The geometry of the dresses were so unique, that they could only be created using 3D printing, and couldn’t be created using traditional methods. 3D printing technology allows designers to think outside of the box, and go beyond peoples expectations, and redefine what is possible.